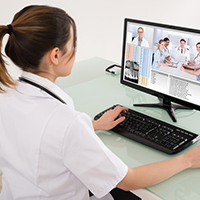 Promoting early rehabilitation for pediatric ICU patients. Dr. Sapna Kudchadkar Introduces PICU Up! PICU Up! 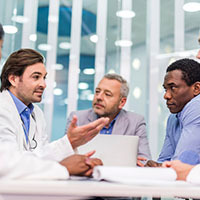 was developed at the Johns Hopkins Children’s Center over a 2-year period of methodical protocol implementation and review including pre-and post-launch testing by caregivers in every clinical discipline across the PICU. 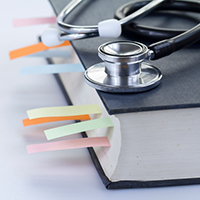 Study results demonstrated that a bundled intervention to create a healing environment in the PICU with structured activity and mobility is safe, feasible, and may have benefits for short- and long-term outcomes of critically ill children. Click here to be notified when the PICU Up! 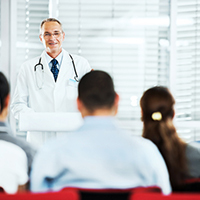 Clinician Guide becomes available. In her insightful TedX talk “Illness shouldn’t mean stillness”, Dr. Kudchadkar outlines her innovative approach to getting pediatric patients up and moving as soon as possible. PICU Up! 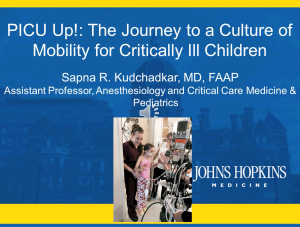 : A Journey to a Culture of Mobility for Critically Ill Children is a narrated presentation from program developer Dr. Sapna Kudchadkar. The 20-minute lecture provides background on PICU Up! and early mobilization efforts, a literature review and a program evaluation. Click here to obtain your free copy of this presentation. 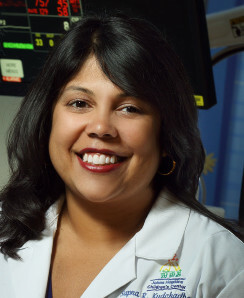 Dr. Sapna Kudchadkar is an assistant professor of anesthesiology and critical care medicine and pediatrics at the Johns Hopkins University School of Medicine and the director of the Johns Hopkins PICU Research Program. Her areas of interest include sleep disturbances in critically ill children, pediatric delirium prevention and management, sedation of mechanically ventilated children, pediatric ICU rehabilitation and mobility, pediatric difficult airway management, and clinical epidemiology and biostatistics.